Show Recap – Never Drink Coffee During A Business Meeting and The Entrepreneurs Organization! #ThatBusinessShow pushes ahead to week 27 today despite the flooding conditions across South Tampa and all over the Bay Area. Growing up in snow in West Virginia, hazardous weather conditions never kept me at home and rain and flooding is no different now. As long as there is a passable road, I will find it and did to get into the station this morning on Gandy and then back to my office afterwards in Hyde Park lol. The show airs weekdays at 8am on 1250WHNZ and can be heard anywhere in the world on your iHeart media app on a smartphone and live on http://www.tampabayradio.com. Opening up the show today was Liza Marie Garcia. Liza is the CEO of Enterprise Communication Services based in Tampa, FL and this is actually her 2nd round as CEO in the IT / Telecommunications Industry. Liza shares her story of being a young entrepreneur getting her company off the ground and some of the challenges and lessons learned in the process to today having a company that works with many well known Enterprise companies like Verizon and more! Liza has also talks about her newly released book, “Never Drink Coffee During a Business Meeting” which grabs young businesswomen by their stilettos and launches them on a journey of caution and self-promotion. “Never Drink Coffee During A Business Meeting” describes how one woman successfully shattered her own glass ceilings by packing her Coach briefcase with the wit and wisdom of the powerful women she met on her way to the top. “Never Drink Coffee During A Business Meeting” examines the state of affairs of women in business today and offers remedy to the anti-female, male-dominated culture that still prevails. It is packed with gems of advice and savvy mentoring shared by the CEO-author. Liza is a committed entrepreneur and mother of two and also bides her time amongst a non-profit organization, Little Light of Mine Foundation, which was founded by Sheri Kendrick and provides photography services to terminally ill children and you can learn more about the Foundation at http://www.llom.org. Liza speaks of this foundation and its mission on the 2nd segment and closes by sharing that her inspiration comes from her belief in Jesus and how he has guided her through her life. 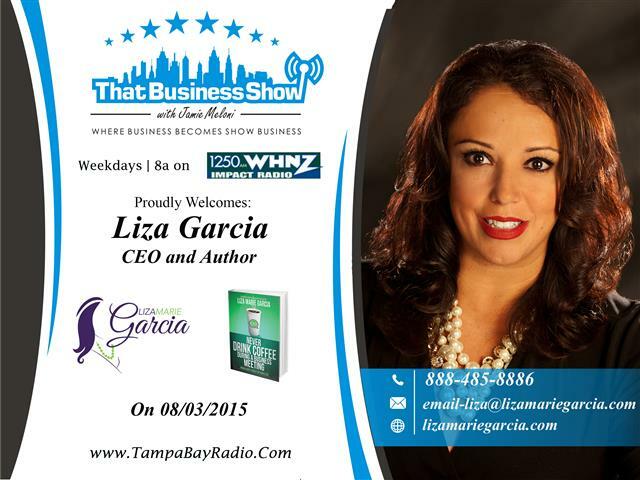 This is a great interview and you can learn more about Liza and her book at http://www.lizamariegarcia.com and email Liza at email-liza@lizamariegarcia.com for more information and be sure to follow her on Twitter @lizagarciaceo! 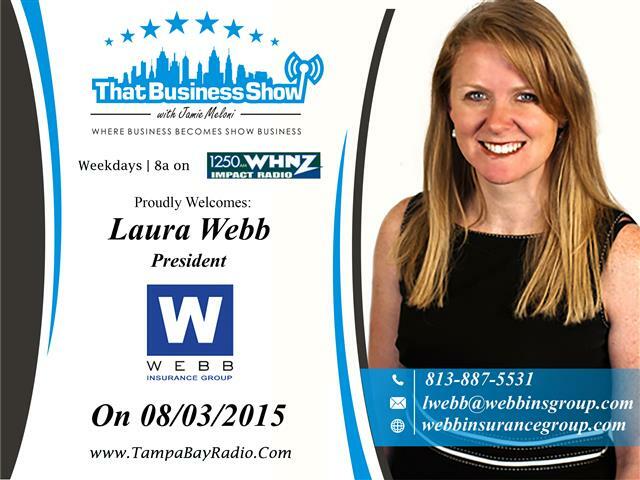 On the 2nd half of the show, I welcomed Laura Webb, President and Founder of Webb Insurance Group. Webb Insurance Group, based in Tampa, is a leading insurance provider and recipient of a number of consumer awards including Best of South Tampa: Insurance Agency in 2011 by the South Tampa News and Small Business of the Year in 2008 by the South Tampa Chamber of Commerce. From auto and home to flood and commercial policies, Webb Insurance is your one stop shop for insurance. Be sure to visit http://www.webbinsurancegroup.com to learn more. Laura was in studio today to talk about the Entrepreneur’s Organization of which she serves as President for the local Tampa Chapter. This is an International organization that is essentially a think-tank of accomplished entrepreneurs that can share ideas and experiences as well as seek guidance from other members from within. The application process is not easy and requires that members have and maintain a $1 Million / Year Annual Gross Revenue stream and be interviewed foe admittance. By joining, you have access to forums and discussion groups as well as their programs designed to accelerate and mentor your business to higher levels of success and profitability. The Tampa Chapter has about 30 members so it is definitely an elite organization and to learn more you can visit http://www.eonetwork.org and reach out to Laura directly at 813-887-5531 on how to gain entry into this elite group. Be sure to mention that you heard about the organization on the radio show too! This entry was posted in Entrepreneurship and Business and tagged branding, business, entrepreneur, entrepreneur organization, foreclosures, it solutions, real estate, telecommunications. Bookmark the permalink. Thank you Jamie for this, the foundation Little Light Of Mine is founded by Sheri Kendrick and we provide photography services ONLY for terminally ill children. Our website is llom.org.